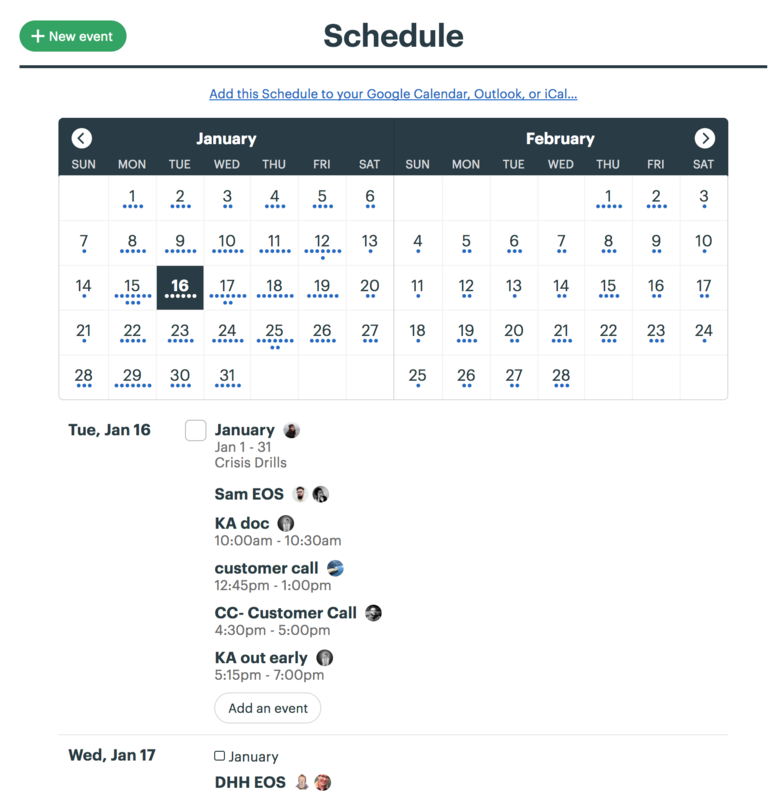 The Basecamp support team is a fully remote team that spans seven time zones and helps our customers 24 hours a day, seven days a week. It’s tough to get everyone on a team on the same page. It can be even harder to keep them there. With our team entirely remote, it helps to have a place to chat in real time. Enter Campfire. Campfire gives everyone a place to talk instantly about anything. It’s where the team goes to ask others about a particularly interesting customer email. Or share the latest Taylor Swift music video. We've even had some fun GIF battles there. As shifts come online and then sign off at the end of the day, there's a flurry of hellos and goodbyes. It’s a powerful tool for making sure that your team feels connected, even if they are on the other side of the planet. 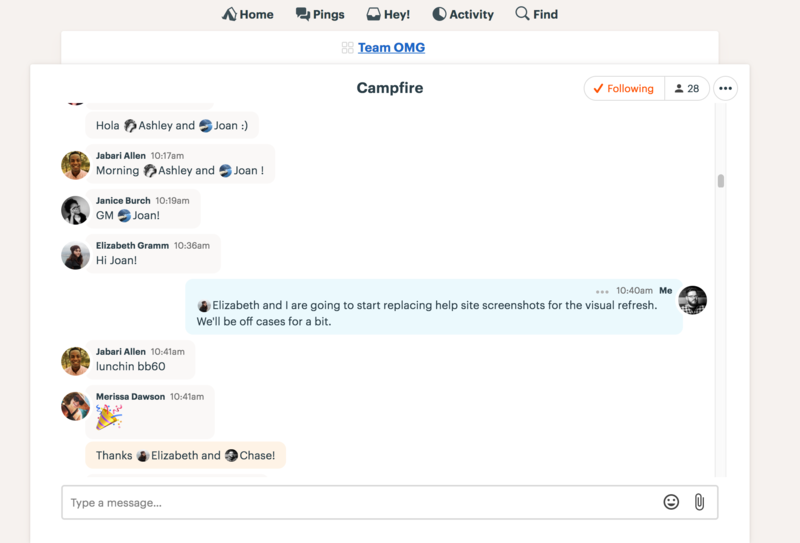 While Campfire is great for those real time chats, it’s not designed to be an all-day meeting. For updates and other messages that the entire team need to see, we use the Message Board. Instead of that message being lost in the never-ending conveyor belt of a chat, it’s right there on the Message Board. Any events related to the team go on the Schedule. These events can be customer trainings or calls, our regular 1:1s, and time off for vacation or appointments. We also schedule time to work on side projects or anything else that takes us out of our email queue. By putting time out of emails on the Schedule, there's space for everyone to work on a range of projects. Without that space, a support team could quickly end up as queue monkeys racing through email after email. We don't need status meetings because we've got something better: automatic check-ins. With the Automatic Check-in tool, we regularly ask everyone on the team a few things. 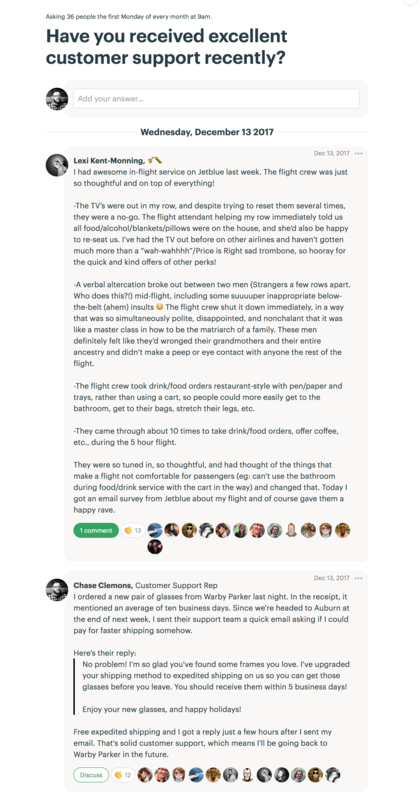 The check-in allows us to talk about questions like “What was a common issue that you saw this week?” or "What's a a great support tip to share with the team?" 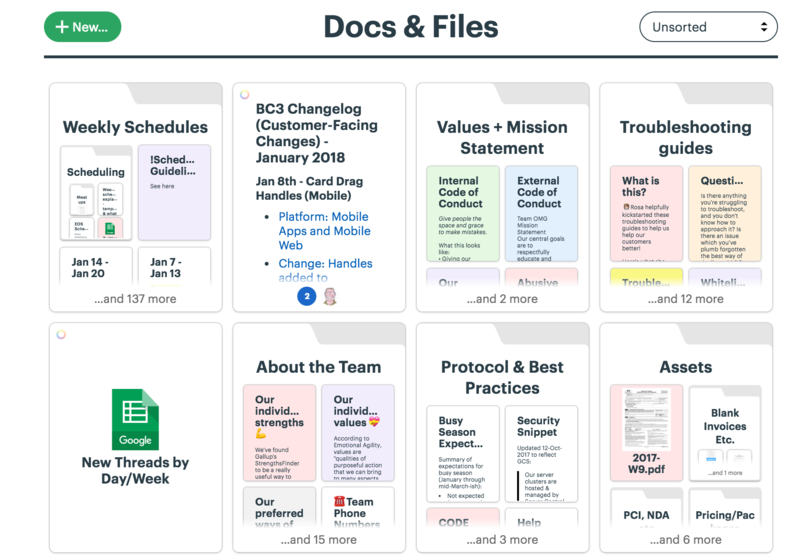 The Docs and Files tool gets a lot of use. It’s the go-to place for files, the online class resources, customer ideas, and anything else the team might need. Everything’s organized by topics using the folder option. And a few of those folders include Readme docs to give a person the gist of that folder and how to use it.